Established during the most tempestuous period experienced by the yachting industry in recent times, Cantiere Delle Marche is a shipyard that bucked the odds by not just surviving, but actually growing into the most successful yacht builder in their market sector. The secret to their success? A business plan that works for the shipyard and their owners, a determination to deliver an investment quality product and building yachts that can face the wildest elements… and to have fun doing so! 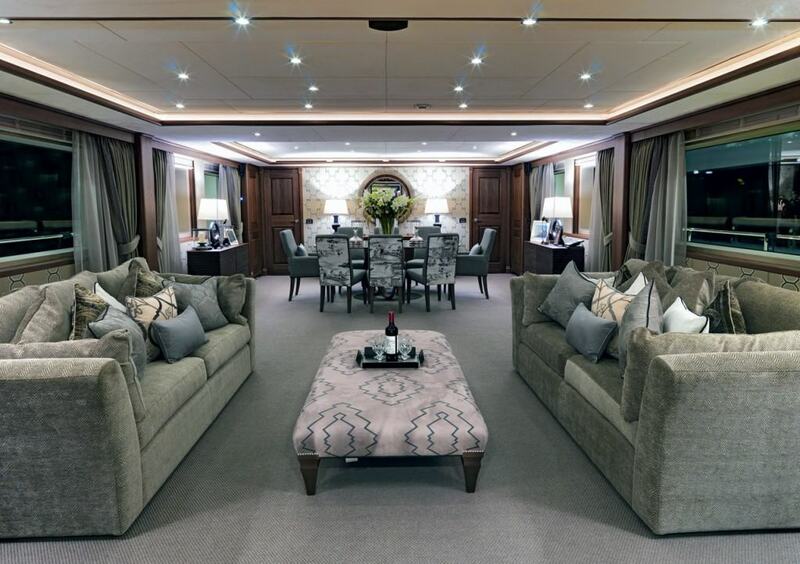 Having been incredibly impressed by the quality of their launches in the past, we were champing at the bit to have a look around and see if the yard’s early exacting standards had been maintained. The first point of note was Sergio Cutolo’s exterior design for the hardy Darwin Class, on this occasion finished in a dark grey hull and white topsides, benefits from the additional length when compared to more modest models in the range. While certainly attractive to those who appreciate real expedition yachts–and here it is worth making the distinction between these true blue water warriors as opposed to fashionable explorer yachts–it’s probably fair to say that the profile of the shorter Darwins may take some getting used to for those who’s experience has previously been limited to sleek GRP cruisers. The 107 however, with her majestic bow towering a full two decks over the bow bulb and high freeboard tapering back through well-protected gunnels, makes a strong statement of intent and is an impressive sight to behold. The 107’s extended aft decks not only lengthen her aesthetic, but are also eminently useful in creating a generous cockpit, stowage on the upper deck for a Cobra RIB 6,6 tender and space for freestanding deck furniture after launch, plus a large sundeck. 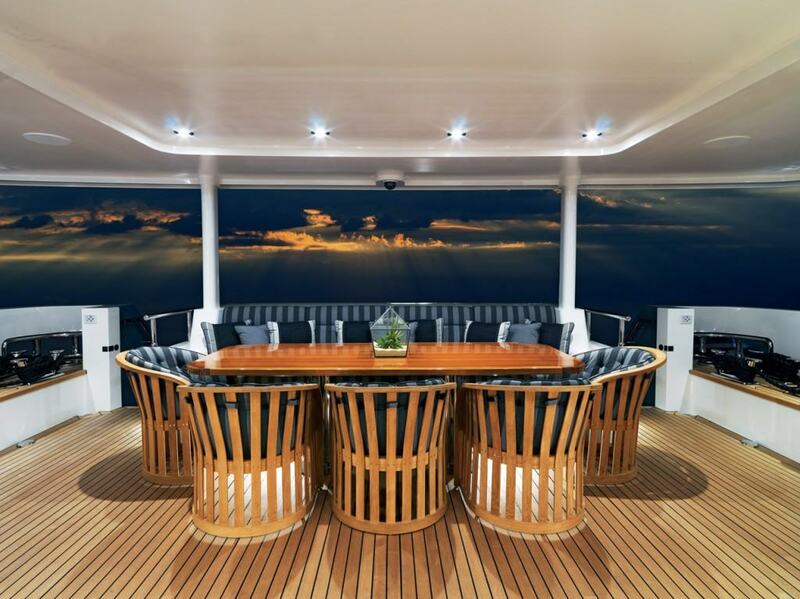 The sundeck, which supplements a very comfortable solarium and lounge in the bow, offers enough real estate to house an arrangement of four fixed sun loungers aft, a full wet bar and dining area amidships and a split helm and lounge area forward. After concluding our tour we joined at least 15 others who were comfortably enjoying the yard’s hospitality on the sundeck, so there’s more than enough space for the usual compliment of between ten and twelve guests. Before even entering the main salon the most uninitiated of guests will understand the authenticity of the yacht’s capabilities: here there is no swish as tinted glass sweeps aside to reveal the yacht’s interior, but instead the reassuring chunk of a heavy duty watertight door. Not only does such practical features lend a sense of gravitas to the vessel, they are also extremely effective at keeping the outside world out and the inside world in. Whatever tempest is rages around one outside, a sense of confidence can been drawn from the fact the family is safely cocooned in an oasis of calm. We’ll not devote many words describing the rather splendid interior design completed for MY Storm by the studio of PFA Design, each photograph tells a thousand, though we will mention how snug and tightly each element holds together, both aesthetically and in the quality of the completion. This yacht may well be a hardy explorer, but her owner and guests will cruise in practical and understatedly luxurious accommodations, as befits discerning English gentlefolk. The use of wallpaper throughout the yacht is an unusual and yet very attractive solution, which makes one wonder why it is not used more. The galley is a very interesting indeed, along with the 2.10m (6’ 9”) high headroom the chef’s domain is of the dimensions one would usually associate with a 40 to 50m yacht. ‘In addition to the wheelhouse it’s the only area the yacht where someone is constantly working,’ Vasco explains, ‘and as the yacht allows it, we decided to make full use of the space. There are some great additions that we included at the suggestion of the crew too, who worked with very closely on this project. The Captain wanted stowage in the galley’s lobby for oilskins and wet gear, almost like a mudroom, so outdoor gear could be removed by crew and guest before entering the yacht.’ Once inside, it’s likely the guests will pull up one of the bar stools at the compact breakfast bar to enjoy a mug of something hot and a snack to warm them through. There’s certainly enough space to create the family country-style kitchen so popular amongst North American owners. 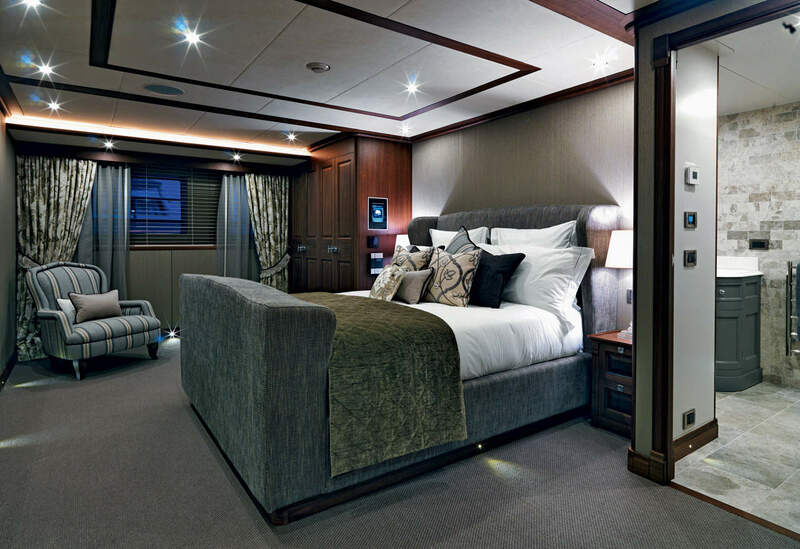 While the generous crew accommodation and square (accessible through the galley’s internal lobby) is a testament to the owner’s appreciation of the need for crew comfort during extended periods on board, his stateroom is on-deck and enjoys full use of the full beam. In the interest of practicality the owner has also conceded space from the entry to his cabin–where a vanity or office would usually be placed–to provide additional storage outside. ‘He decided he simply sleeps in the cabin which is already more than sufficient in volume for him, so he gave the space to make the crew’s life easier,’ Vasco shrugs. Heading into the owner’s en-suite and then down to the four guest cabins on the lower accommodation deck we can attest that generosity of space is certainly not something this yacht is lacking. The generosity of the owner in devoting space to his crew is further evidenced by the inclusion of a radio room adjacent to the wheelhouse from which the Captain helms his Storm powered by twin Caterpillar C18 ACERT 500kW engines. Producing a modest 640hp each, the fuel sipping economy of this 107’s propulsion and hull package means she’ll cover 5,000 nautical miles between refills of her 14,635 gallon tanks: the quickest of calculations shows consumption of around just three gallons per mile at 10-knots. Her top speed is a touch below 13-knots and recommended cruising speed 11-knots.